I've been craving clam chowder and bought a can of clams and some clam juice, but it's been sitting in my pantry--waiting--until now. I made Spaghetti with Clams, Leeks and Garlic Chives for a birthday party the other day, so with a bundle of clams leftover from the party and the canned ones in the pantry comes a perfect time to make some clam chowder! You don't have to use fresh clams, in fact, I kind of prefer the canned ones--not the baby clams, but the chopped ocean clams. I bought the canned clams at Smart & Final. 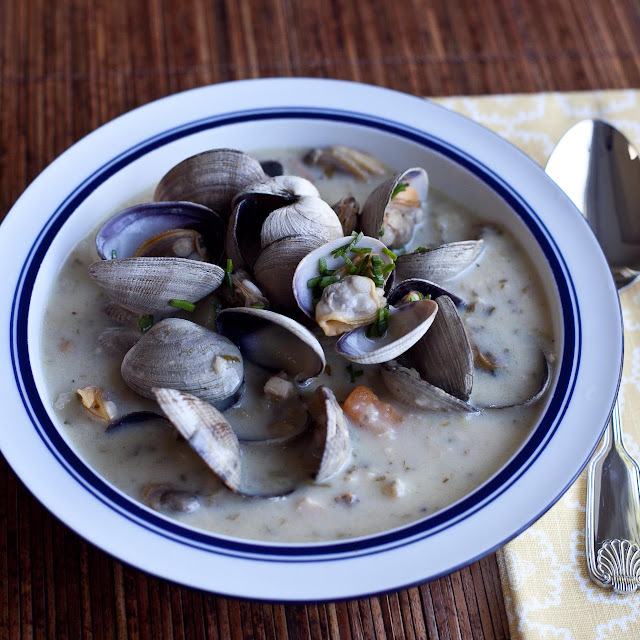 I made the chowder with the canned clams, cooked the fresh steamers separately and added them to the top of each bowl. I bought the fresh clams at Costco. It was the first time the clams I got there were a little gritty--up until this time they were cleaned and didn't have sand in them. 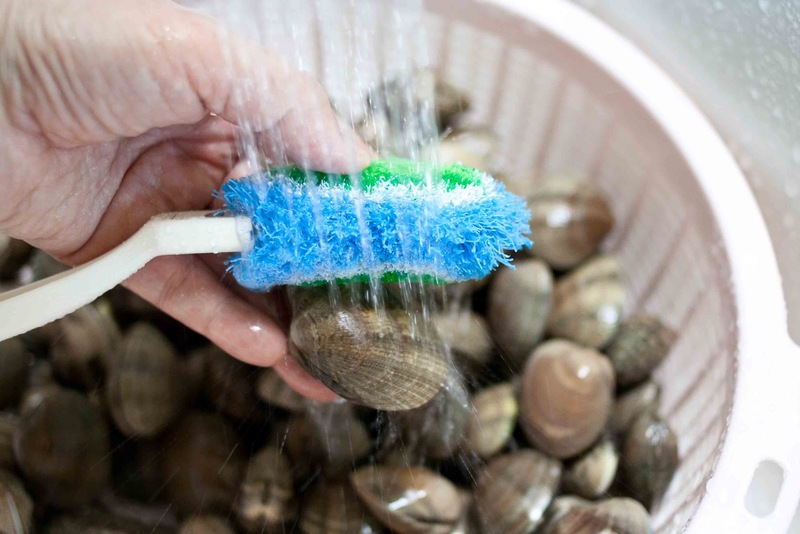 To clean the clams so they don't have sand inside them, put them in a bowl of 4 cups water with 2 tablespoons sea salt dissolved in it (the water line should be so the clams are covered with water halfway up their shell), in the refrigerator for several hours. The clams will siphon the water in but then spit it out along with the sand in their stomachs. Soak them in freshwater for about an hour before serving so they're not too salty. I didn't take photos of the ingredients this time, but these are from the Spaghetti with Clams, Leeks and Garlic Chives recipe. 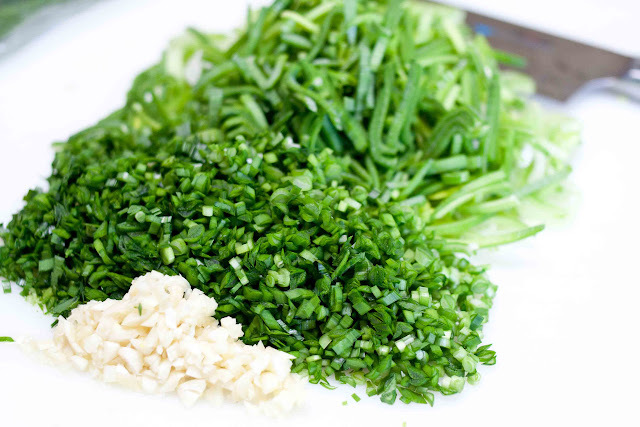 Wash the leeks and chives well and slice thinly. The rest of the cooking instructions are in the recipe below. Looking at the photos I took the last time I bought clams from Costco, the clams in the picture above are farmed Manila clams. 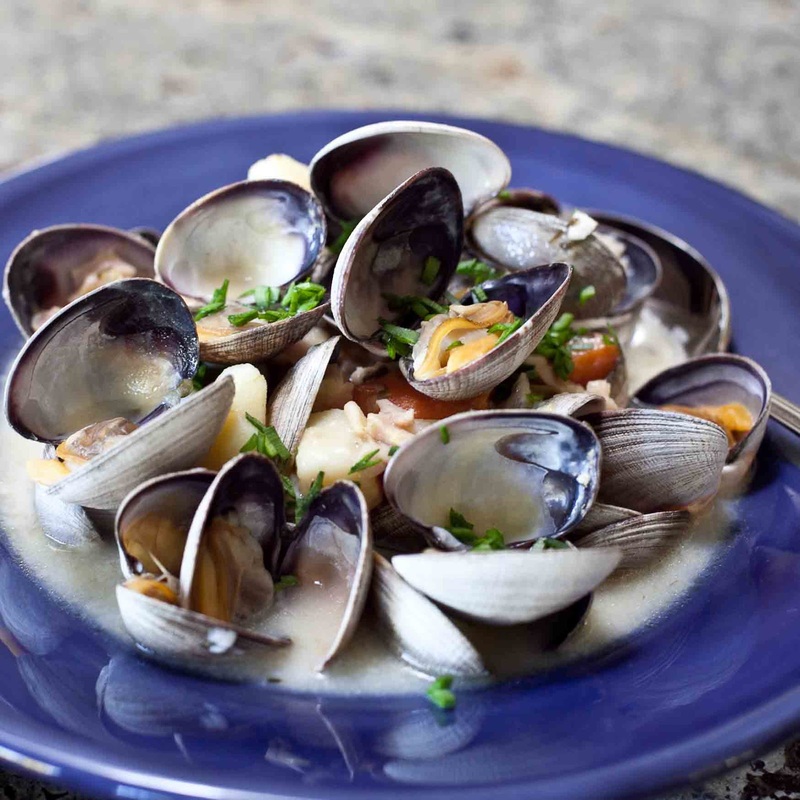 The ones I used this time are not the same variety, they're white shelled, where the Manila clams are brown. I didn't notice what variety the ones I bought this time were (reinforces the fact that I should have taken photos!) or if they were wild (which would explain the sand). This recipe makes a 7 quart pot of soup, which will serve about 10-12, so you may want to cut down the quantities. 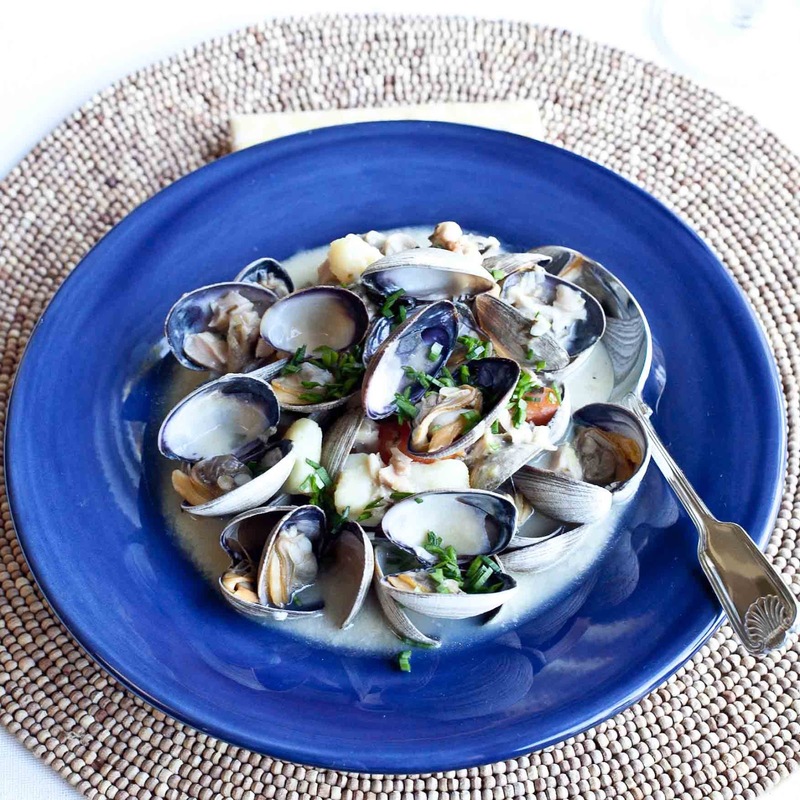 If using fresh clams, clean by soaking them in salty water for several hours so the clams spit out sand, then soak for an hour in fresh water. Drain and set aside. In a large 7 quart pot, saute chopped leeks, garlic chives, onions, celery, carrots, potatoes and garlic in 2 tablespoons olive oil and 2 tablespoons butter over medium-high heat until soft and wilted, about 15 minutes. Sprinkle 1/4 to 1/2 cup flour on vegetables and mix well, with the flour absorbing any fats and liquid in the pot. Add the can of clam juice and juice from the canned clams, mixing well until evenly incorporated. Add water if necessary to make the vegetables/broth ratio how you like it--I added about 5-6 cups water and spices. Simmer about 30 minutes on medium/low heat until the potatoes and carrots are tender. 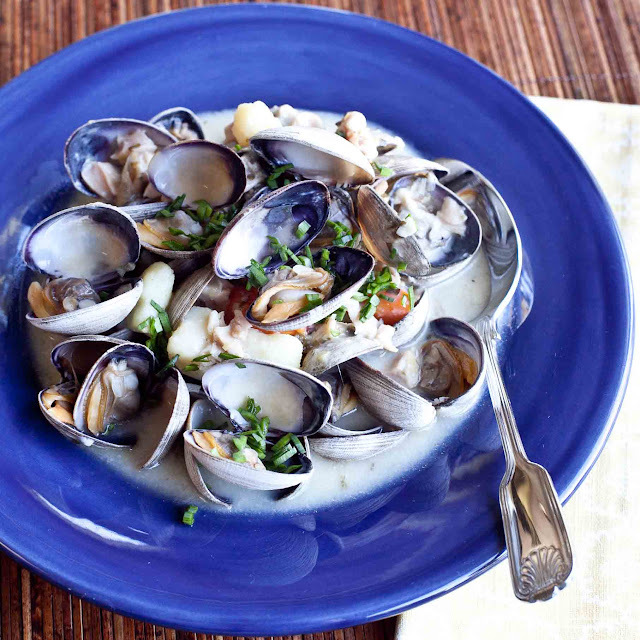 Add the canned clam pieces and the half-and-half or milk. Taste and adjust seasonings. To make the soup thicker, mix 2 tablespoons cornstarch with 1/4 cup water. Stirring constantly, add, a the cornstarch, a little at a time, to hot soup (just under boiling) until desired thickness. Reduce heat and hold until ready to serve. 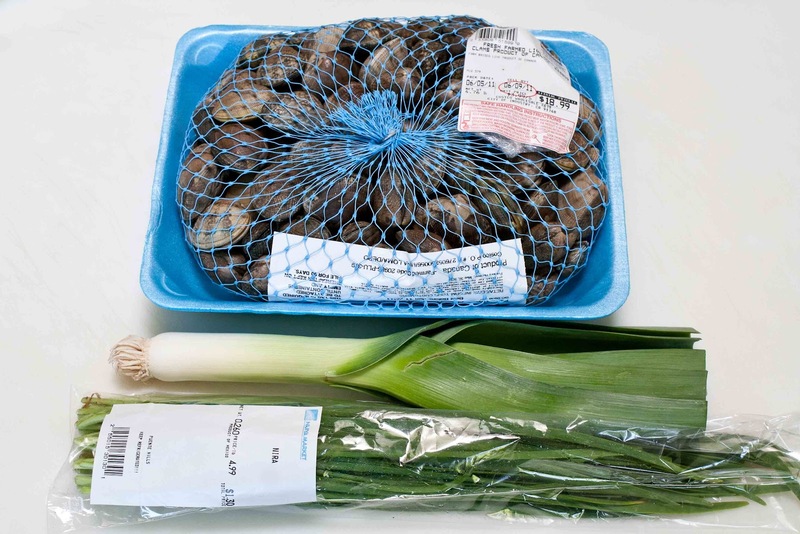 To steam fresh clams, boil about a 1/2 inch of water in a large frying pan, place clams in the pan, put the lid on and steam for about 5 minutes or until clams are open. 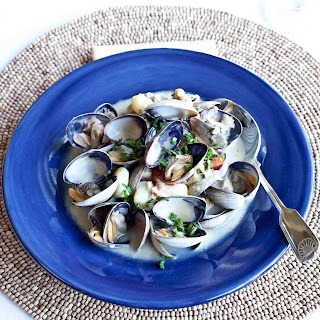 Ladle hot soup into bowl and place steamed clams on top. I've been doing some knitting. This little afghan is so simple to make, it only uses one stitch, garter stitch. You can use your leftover yarn or any collection of colors you like. 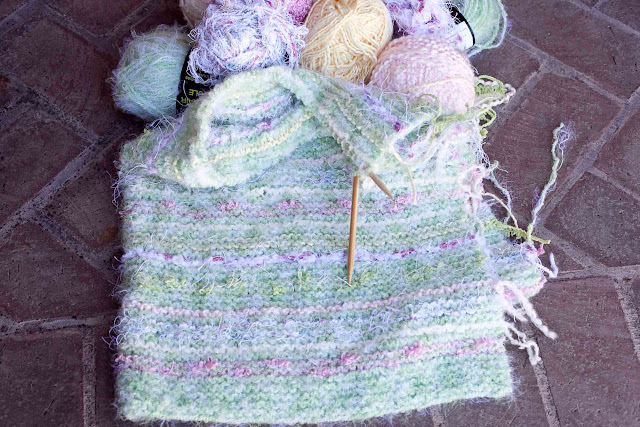 I collected these colors for a little girl I have in mind and I wanted the blanket to look like a spring garden. I'm using a 10.5 US gauge knitting needle, but I think it could stand to be a bit bigger since the afghan is a little on the thicker/heavy side, so a 13 or 15 might be better and make the blanket more airy. I cast on 100 stitches in the green, knit 6 rows to make an end border, change to a different yarn and knit 2 rows, change back to green and knit 3 rows. I'm using an odd number of rows between yarn changes so either side can be the right side. Repeat until you've reached desired length and knit 6 rows of green for an ending border. To finish, I'm going to make a fringe on the ends with matching yarns.